When my brother and I were growing up, we had a lot of fun with our cousins Laurel and Lance. We were Baby Boomers, all born between 1946 and 1950, and we lived in neighboring towns in Connecticut. We probably saw each other twice a month growing up, but it's the holidays that I remember most. For example, the Fourth of July cookouts at our house in Fairfield, followed by walking down to Jennings Beach to watch the fireworks while sitting on my father's scratchy old Army blankets. Or cookouts at Laurel and Lance's house, in Trumbull, where we'd play a vicious game of croquet across their sloping backyard -- we'd whack our opponents' balls downhill to the edge of the property, underneath Aunt Margaret's maple trees named Phoebe and Minerva. However, the holiday I remember best is Easter at our grandparents' home. And I find that when I think back on these memories that I'm looking at them with two different sets of eyes: the eyes that I had as a child, and the eyes I have now as a parent. And it's amazing to me what I see now, looking back on these memories, compared to what I saw as I was living these memories. 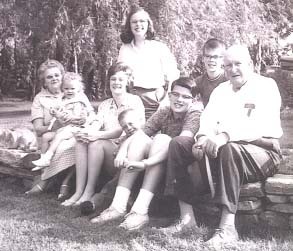 Our grandparents, Gram and Buck Elliot, lived in the rented half of a two family home, 745 Laurel Avenue, Bridgeport, about halfway between our house and our cousins' house. One of the first things that would happen once everyone arrived was taking the black and white pictures outside. I remember being lined up, facing into the sun, and waiting endlessly for the pictures to be taken. My Father was our enthusiastic photographer, and now I know why it took him so long; he had a 35 mm camera, so he had to take the light meter reading, adjust the shutter and aperture, focus on someone's wiggling finger, and then finally take the picture. 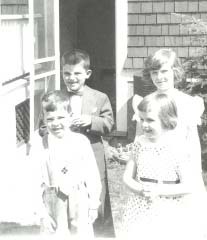 There's one picture of the four cousins all dressed up in their brand new Easter clothes: Laurel, the oldest, is patiently looking at the camera, smiling a no-tooth smile; my brother Kim is swatting at some insect; Lance is saying "CHEESE" at the camera; and I'm looking off to the side. When I look at that picture now, I imagine that my mother, wearing her one good suit and her pink rhinestone heart pins, was watching us and murmuring to her sisters: "Don't they look so grown-up in their new clothes? Look at how long their legs are -- I can remember when their arms and legs were the same length. Oh, look, Laurel doesn't want anyone to see the holes in her smile where her baby teeth have fallen out. Who does Kim look like -- does he have the Elliot head?" It turns out that Kim does have the perfectly shaped Elliot head, just like Buck's. The next major event in our Easter celebration was the meal. If it were cold, the cousins would eat on a card table set up in the living room. The living room and dining room in my grandparents' apartment were virtually the same room -- there was a 10-foot opening between the rooms, with wooden pillars on each side of the opening. However, if it was a late and warm Easter, the cousins got to eat outside on the side porch. There was a covered porch that went across the front of the house, past Miss Keach's front door, my grandparents' front door, and the bow windows in my grandparents' living room. Then the porch wrapped around the corner of the house, and went down the side of the house, past the stained glass piano window, stopping just before the dining room bow windows. The card table was put as far away from the street as possible. Looking back, I wonder if that was done to prevent the traffic on the street from bothering us, or to prevent the people on the street from seeing how much goofing around we were doing. We goofed off a lot while eating together. First we had to say grace. Our grandparents were Presbyterians, and our cousins were too. But my parents had a mixed marriage circa 1943 -- my father was a Catholic. When they got married, it had to be at a side altar of the cathedral in Bridgeport -- no mixed marriages were allowed at the main altar. Anyway, Kim and I were Catholic, and so the cousins knew two different graces: the Presbyterian one, "God is great, God is good. Let us thank him for our food. Amen. "; and the Catholic one: "Bless us, oh Lord, and these thy gifts, which we are about to receive from thy bounty through Christ our Lord, Amen." To get around this problem, sometimes we just said the word, "Grace." So if we were asked later, "Did you say grace?" we could truthfully answer, "Yup, we said 'grace'." But sometimes we used a compromise grace that we all liked, "Rub-a-dub-dub, Here comes the grub. Yeah God!" Not surprisingly, we would get several parental visits during the course of a meal. I remember the same thing happening every time Uncle Joe came out. Everyone knew what was going to happen. When our younger cousins, Eric and Lee-Ann were old enough to join us, even Eric knew what was going to happen. Uncle Joe would appear, and Eric would try hard to suppress the glee on his face, but his big hazel eyes, so like his father's, would be dancing around. Then Uncle Joe would say to his son, "Lance, you haven't touched your milk." So Lance would stick a finger in his milk and say, "OK, I've touched it now." Then we'd all be snorting and giggling, except Lee Ann, the youngest cousin. She was rather shy as a pre-schooler and tended to look at us suspiciously, like we were some sort of aliens. However, the highlight of Easter at our grandparents' was the Easter egg hunt. Everyone would bring their eggs: ours were made Batik-style, using a wax crayon; Laurel's were usually more artistic (not surprisingly since she's an artist now); and our grandmother's were your basic solid-colored dyed eggs. So there would be this fairly large collection of eggs which our parents and Buck would hide in the backyard, in "plain sight" along the edges of Buck's well-tended flower beds. "Plain sight" meant that some portion of the egg was visible from some vantagepoint. We kids had to stay in the living room, clutching our Easter baskets, now just filled with that vividly colored cellophane grass -- we had left all the chocolates at home. On the signal, we would stream out the back door, and down the cement steps of the back porch to find as many eggs as we could. Whoever found the most got to hide the eggs during the next egg hunt. We generally had enough hunts so that everyone could hide the eggs at least once. Looking back, there are two reasons why I think our parents enjoyed watching us hunt for the eggs they had hidden. One, I remember my aunt Merilu coaching me, probably when I was the youngest before her children were born: "Kate, remember all the eggs don't have to be on the ground." I looked up at her, puzzled, until I followed her gaze to the crotch of two branches in the Japanese red maple. "Oh!" I happily exclaimed, as I reached up for the egg that was balanced there. Second, I know how much fun it is to watch kids find eggs you've hidden because I've done that every year for my son. This year I hid plastic eggs, each with a chocolate inside, in plain sight, for my son and his cousins to find. I watched to see who would think of going around to the far side of the boat trailer, and stooping down to see the pink egg sitting on top of the tire. Stephanie, my 14-year-old niece, found that one. So, I think it's amazing all the things I missed seeing during my childhood that I can see now. And I wonder what else I'll see in about 20 years, when I'll hopefully be a grandparent, as I look back on these memories, when I'll first be able to imagine what my grandparents were feeling as they watched their grown daughters hide Easter eggs for their grandchildren to find. Copyright � 1996 by Kathryn Eike Dudding. All Rights Reserved.